Confession time: despite my best intentions, it took me over 6 months to get my compost system up and running in this house. We were busy adjusting to our new life, I guess, and it just kept getting pushed aside. That is, until my godfather upgraded his own composting system (he built a beautiful wood and wire bin system – maybe I’ll photograph it some time) and offered me his old bins. Yes! I was in business. I’ve been composting for a little over a year now, which means I’m churning out batches of black-gold-plant-power at pretty regular intervals. It’s gold, I tell you! Garden gold. After my recent gardening posts (one and two), readers began asking about easy composting systems. And guys, it doesn’t get much easier (and cheaper!) than this. Bin composting. The idea behind bin composting is simple. You move your compost through a series of containers, slowly over time, thereby mixing it and aerating it along the way. 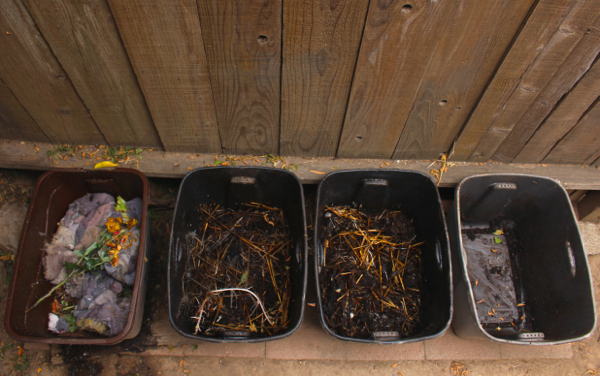 Compost needs to turn over in order to break down into dirt (as opposed to just rotting), and transferring a batch from one bin to another is a perfect way to achieve this effect. 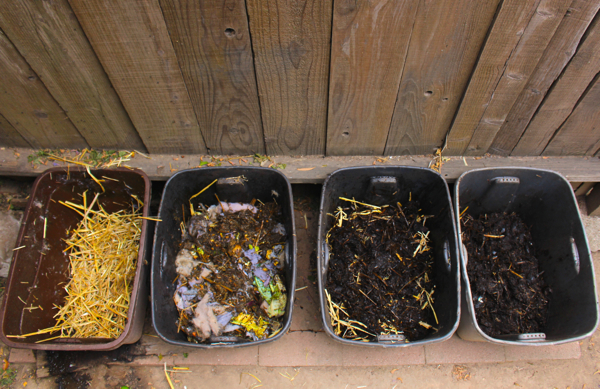 So it goes like this, when bin 1 (far left) is full and ready to transfer, remove all the finished product — now fully composted pure garden gold — from bin 4 (far right). I put my finished compost in a 5-gallon bucket so I can carry it around my yard, feeding my plants along the way. With bin 4 now empty, you can transfer the contents of bin 3 (second from right) into bin 4. Use a shovel or pitchfork and make sure you get it good and tossed. Now bin 3 will be empty, so move the contents of bin 2 (second from left) to bin 3, using the same “toss and aerate” technique. You’ll also want to add “browns” here. In the diagram above I said hay because that’s what I use, but any “browns” (dry matter – see my comprehensive composting article for more on that) will do. You need to add in “browns” along the way in order to keep the correct ratio of nitrogen (“greens”, ie kitchen scraps) to carbon (“browns”, ie hay, dried leaves, etc). Make sense? With bin 2 empty you can now transfer the contents of bin 1 over to bin 2. Don’t forget to add in some “browns”! And finally, that leaves an empty bin 1, ready to start collecting all of your kitchen scraps and yard waste, once again. That’s dryer lint in bin 1 on the far left. Yup, it’s compostable! With a nice bed of hay all laid down in bin 1, ready for the next round of fresh compostables. And that’s all there is to it. Setting yourself up with a bin composting system is incredibly cheap, especially if you can find the bins secondhand like I did (check garage sales and resale sites like Craigslist for some super scores). Oh, and make sure you poke some holes along the bottoms of the bins, so the wormies can get in. 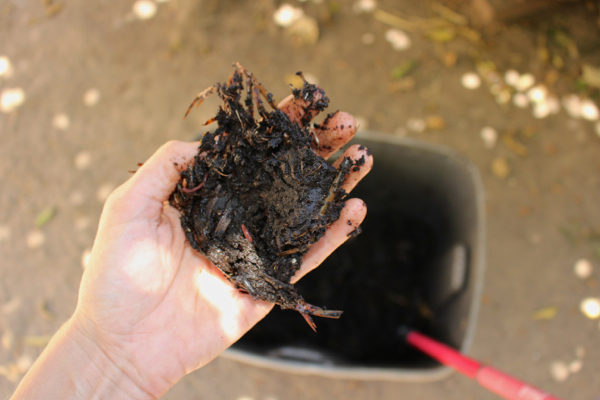 Worms and bugs are your compost pals! If you’re concerned about composting in plastic (obviously I’m not, but I understand if you are), you can achieve the same effect with wood or metal. Like I said, my godfather built some wood and wire bins that are quite lovely, and some day I hope to do the same. 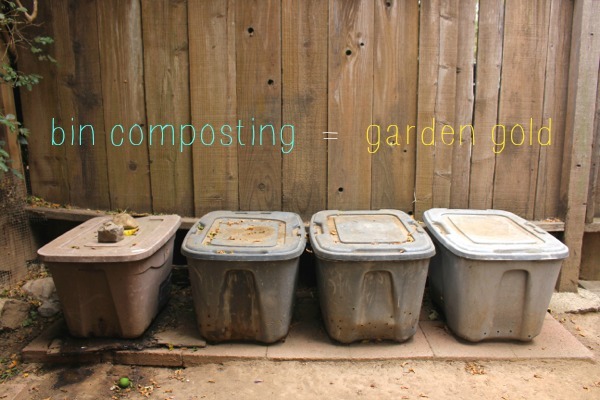 So, do you compost at home? 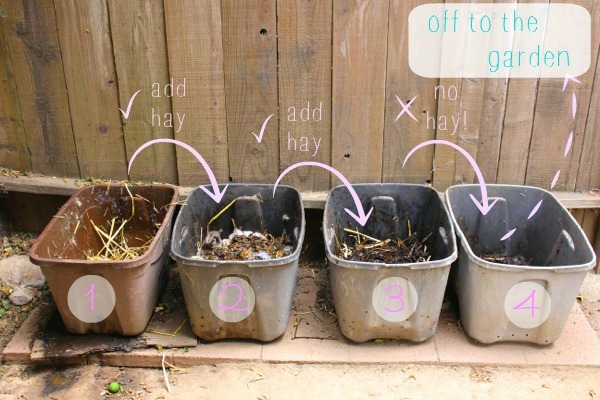 Do you use a bin composting system, or something else entirely? Let’s talk compost down below! This is a fantastic idea and is yet another reason why I eventually need to move out of my small, city apartment. Any suggestions on how to implement a composting system in apartments? I have a relatively tiny balcony, so perhaps it could fit there, but I suspect it’d need to be indoors if anywhere. I’ve read a few articles on this matter (see: http://ecowatch.com/2013/12/16/how-to-compost-apartment/) but I’d love to hear if you have any personal recommendations. I like this simple idea and the fact that no tools are needed, just pick up and pour. We scored a stackable worm farm compost system, that seems like it would suit a balcony. Because it goes up, it doesn’t use much space. Ooh, just another thought – if you’ve got more compostable stuff than you have use for, maybe you could just keep a sealed bucket under the sink and drop it off the local garden club/community garden or something? This is how I used to do it! Love it, it is so easy! What a great idea! We were fortunate to have a friend and her son build us a nice wooden worm box which is great. But then I noticed a pregnant black widow nesting in the lid so I decided to leave it alone for a while :) and all the wormies have died. Now I hope to hatch some of the eggs that must be in there or else need to get some more worms….. I have a small spinning composter (http://www.amazon.com/Envirocycle-EBC-BK-Original-Composter-Black/dp/B004FVEDAI/) that I was able to use on a deck in an apartment, and now next to my back stoop in a townhome. I’ve also, when that got full and/or didn’t want to deal with it, accumulated scraps in a plastic container in my freezer (so no rush to dispose of it, no smell), and then passed it on to friends with either compost bins in their yards or compost pick-up with their trash (within PDX city limits). You could do a small 2-bin system on your balcony! Basically one for adding scraps to, and another that’s “cooking”, that you just keep turning and mixing and adding browns to over time. That would totally work. Woah, that contraption is fantastic! And I’m cracking up at “the classy way to compost”, haha! Yeah, compost can also go in the “green waste” bins if your city picks up that kid of stuff (usually gardening/landscaping waste) and lots of cities even have compost pickups. I guess that depends on where you live, but you could definitely save it and pass it along to *some*where, I’m sure. Totally! Fancy compost equipment is fun (and aesthetically pleasing, I’ll admit) but composting doesn’t *require* any of that stuff. Ooh good point, thanks for the heads up. I’ve seen wire/mesh systems but those won’t get as hot obviously. But you’re right, using something like a steel tub might lead to temperature problems. What do you do now Melissa? Ack! We’ve had a few widows show up around here too, so scary! Especially when you have kiddos. Hopefully you’ll be able to revive the worm bin though! It’s such a cool system when it’s up and running. Ooh that one is super pretty! Is it easy to use? It sure has great Amazon reviews! That is brilliant! I’ll have to remember this when I eventually have a place that has a yard and I can set up a composting system! I can’t see my hubby complaining about this system! Awesome – thank you for this! One more question – how often do you throw in a layer of browns? I see it as a bottom layer on the first bin and then on the photo graphic you noted to add brown upon transfer, but do you add browns in the first bin at any other time? Now it’s time to get a pitchfork and some bins so I can try to salvage the mess of a free pile I have in my yard and actually turn it into a composting system! Are the bins just regular old plastic bins? Do they have holes in them at all? Wow! This is so cool! Saving this for the someday when I’ll have a little bit of space to do this. Thanks! If you read the article link it will explain a lot more, but basically you need about 4:1 browns (dry stuff) to greens (fresh-y stuff). So you want some hay/dried leaves/what you can get/etc on hand to add. I keep a little sealed bucket under the sink for kitchen scraps/coffee grounds/etc and go out and empty it every few days (usually when I empty the rubbish and recycling because I’m lazy… or “efficient” haha) and then add more browns on top and give it a stir. This is only for the “filling up” stage – once it’s full, you leave it to decompose and ‘cook’. Yeah all of Australia (or most) about 5 years ago halved our rubbish bins and have garden waste and recycling every other week to compensate. Good idea. There was a lot of mum uproar about it at first, but really it just made people aware that their rubbish isn’t necessarily rubbish and shouldn’t go to landfill. Ideally we’d all have a lot less rubbish if things weren’t packaged so much, gah. I read about some rubbish challenge where you save anything ‘dry’ (as in plastics etc) that you wont reuse for one week, then look at it all and suss what you can improve on. I think seeing it all in one big earth-killing synthetic pile would help with your shopping choices. I try and reuse and only buy stuff in containers I can use again, but the amount of unnecessary twice wrapping and plastic is near unavoidable. I REALLY want to meet the folks behind this marketing strategy; “worm cafe” is just hilarious. But seriously, thanks for the link and all of the information you provided above! I really appreciate it. Thanks, Sayward! I think I might try implementing a 2-bin system (not sure if I can get my partner on board with worms quite yet) and will see how that works. It turns out it’s an Aus company called Tumbleweed who make composting/worm farm stuff. It’s mostly directed at kids actually! There’s been a big rise in NGOs and independent companies doing a two pronged approach to address the environment and childhood obesity, which is pretty cool. Loads of schools, public especially, have veggie gardens now, and some (generally high schools) have kitchen programs too. It’s forming practical healthy habits that will hopefully last into adulthood. I caught a bus at 3.15 the other day and it was full of school children with canvas bags full of veggies. Brilliant. I’m so glad you explained your system – I was very curious from the photos. My city does not offer green waste pick up – they crushed the concept before they even initiated the small trial. Good grief. Alas, I’ve always grown up with composting and have established two systems in my yard. I have a traditional composter – greens in the top with a bit of brown, compost out the bottom/side flap. For one person, I usually fill it to the very top by winter’s end [downfall of living in Canada - my composter does freeze] and am able to harvest about four to five wheelbarrows full in the spring. In conjunction to my green composter, I also have a “green cone” which is a digester. It can accept greens, but also things not appropriate for a regular composter – pet waste, dairy, meat, bones. It is not intended for browns. The contents of this unit are only emptied every few years, and are not to be added to your garden. I’ve had mine for six years, and have not yet required to empty the digested contents. It gets used sporatically through the year, but is essential to having enough green waste space it throughout the winter. To both my composter and digester, I do add a natural bacteria tea each spring and early summer to help reboot after a long winter. Whether it helps, or I just feel better sharing some tea with my composter… who is to say?! I have two worm bins under my kitchen sink. Mostly because I’m lazy and don’t like to sort that often! There is a wonderful book called Worms Eat My Garbage by Mary Appelhof that helped me a ton. Thank you so much for this post! I am so excited to make my compost gold and seeing how simple it can be got my rear in gear. See my photo below! I do have a question about how long the goods should marinate in each container – maybe an estimate time frame? Oh yay! You look all ready to go, that is so awesome!! So I don’t have a specific time per say, it’s more to do with how quickly I fill that first bin. When it’s maybe 3/4 full of scraps and hay, that’s when I transfer everything over. It ends up being maybe an average of 4-6 weeks? Thanks! I am seeing how this is a bit of an art. I love taking out the compost so I can get a peak at whats brewing out there. System installed. It took less than six hours from conception to installation. Our fourth “bin” is our old compost container—a more traditional top loader bottom retriever system—that was much too small. This system should add about 50% onto the system capacity, and hopefully the aeration will help turn it to compost faster! Our previous attempts at bin composting failed due to lack of browns—the pile gets super gross in a plastic tub without proper aeration and dry materials. We also had it on our patio, and it really needs to be on dirty for the worms and other bugs—adding by hand is not sufficient. Glad your post convinced me to try this again! Fingers crossed for black gold and a lush garden.